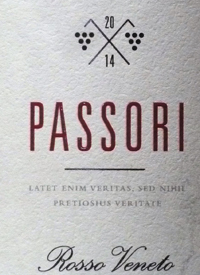 Veneto, ItalyRipe, rich and concentrated, the Passori is a blend of later harvested merlot and corvina fermented to medium dryness and retaining the velvet underbelly of intentional residual sugar. Dried plum, fig, prune is bolstered by time in oak, which provides a frame for the rich fruit and a spicy counterpoint to the heady concentration. Plush tannins carry a drying grip while this full bodied Venetian holds the 14 percent alcohol easily, making a pair for richer braised lamb casseroles or sharp cheese plates.Tasted: 08 February 2016Tasted by: Treve RingPrices: BC	17.99	private wine shops Producer: PassoriDistributors: David Herman & Son Ltd.